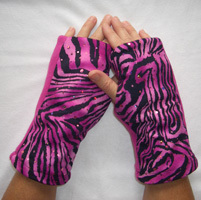 These Pink Zebra Sparkle Reversible Fingerless Gloves are fashionable and FUNctional! Add some pizazz to the ‘Pink Zebra’ style with this highly fashionable animal print combination of black and white zebra and pink zebra with sparkles that reflect like jewels. The Pink Zebra Sparkle Reversible Fingerless Gloves has 4 patterns and colors that offer a variety of ways to be worn. The Pink Zebra Sparkle print side has solid pink on opposite side. The reverse side is Zebra print with solid black on the opposite side. The Pink Zebra Reversible Fingerless Gloves are made of premium fleece (U.S.A.) and patterned fleece and suede cloth (Imported).